What you are about to see, my friends, is the fruits of my labor from this past summer. If you're a regular reader on here, you probably know two things: 1) We tried to sell our house, but in the end decided it was wise to stay where we are and 2) I haven't been blogging much this summer. I had to take a break from blogging because I needed every spare minute to sell off any and all possessions that wouldn't fit comfortably in our home or that weren't serving a purpose anymore. 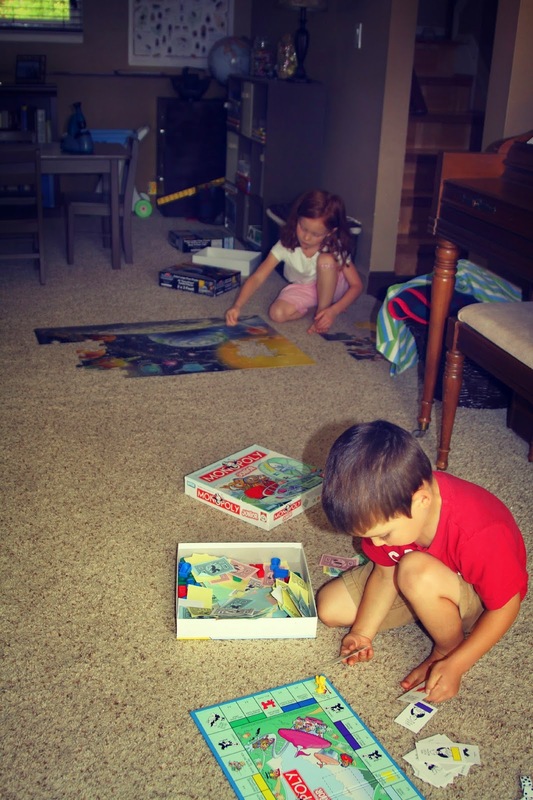 This allowed us to have space to breathe and feel peace in our home These were both severely lacking due to all of the stuff that was cluttering up our home. After the huge purge and redecorating, I cannot tell you HOW HAPPY I am with the end result. It took a lot of work, but I am thrilled with how it all came together. I cringe to think back to the way our living room used to look. Keep in mind, I am not gifted in the area of decorating. Truly, I'm not. However, the Lord put within my heart a vision for what I wanted to see come together and He faithfully provided just what we needed, mostly through great second-hand finds. Our budget could not sustain a redo like this, but thank the Lord, my awesome local buy, sell, trade Facebook group has allowed me to sell what we don't need, in order to purchase what we do need. Every item that was purchased for our school area was bought with cash from money I made selling this summer. Thanks for taking a minute to see how it all came together! This little space makes my Momma heart smile and give a sigh all in one. Mostly because it allowed me to accomplish a burden that was on my heart. I wanted to create an environment that was an open invitation to learn, but I wanted it to stay peaceful and organized. This cubby is a little wonderland for both of those goals. I cannot believe the educational goodies I found for incredible prices at garage sales this summer. Many of them are stored right in this area and the kids love them! Having easy access to games and puzzles allows our children the chance to develop their minds and learning takes place without my prompting. Needless to say, I just love this little area that reflects a vintage feel, all while keeping educational tools easy to access but still organized. A few more details about the cubby....The clock was snagged from our bedroom and I loved the vintage/classroom feel that it brought to the area. 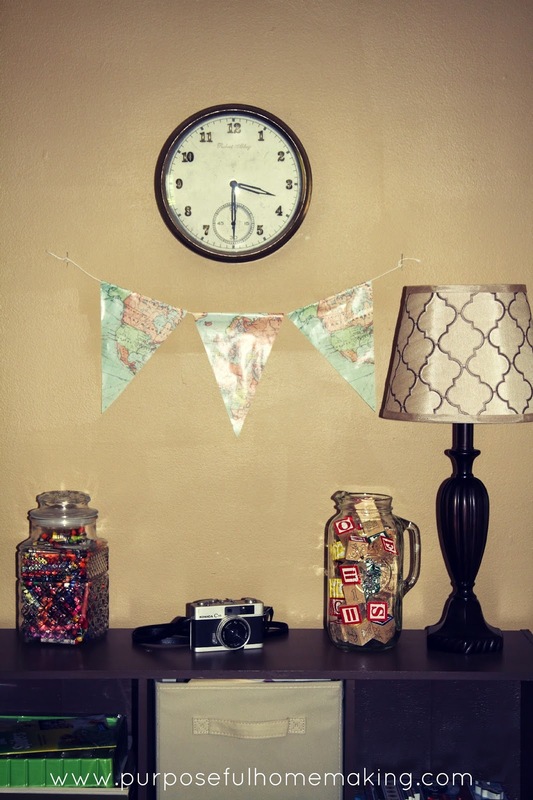 The map bunting was made from an awesome find at a new store I fell upon while on a date with one of our kids. It's called the Paper Source and I could spend HOURS in there (and spend lots if I'm not careful!). I purchased a Vintage Maps Gift Set which just sets my heart racing thinking of all the possibilities with this splendid little set. It came with thin paper gift bags, so I simply cut them into bunting sizes (I got two buntings per bag), strung them with twine and used two pins to secure them to the wall. It is exactly what I envisioned and makes my heart happy every time I look at it. The kids and I were die hards this year when it came to scouring garage sales all morning long every Thursday, Friday and Saturday and oh, how the Lord provided! Towards the beginning of the summer, I found this awesome glass storage jar with a secure lid that I keep on the left top shelf of the cubby. I use it for the kiddos crayons (sure beats the old baby wipes container they used to reside in!) and love the look of it! I am a huge fan of Mason jars of all shapes and sizes and decided to use this Mason pitcher pictured on the right to store the Melissa and Doug wooden blocks. The camera happened to be a freebie! The cubby itself was formerly pink and was exactly what I was looking for when I discovered it on a buy/sell/trade Facebook group. Buying it used and painting it with DIY Chalkboard Paint I already had, saved me money and guaranteed it was a perfect match to the kids' table, which I'll get to in a minute. 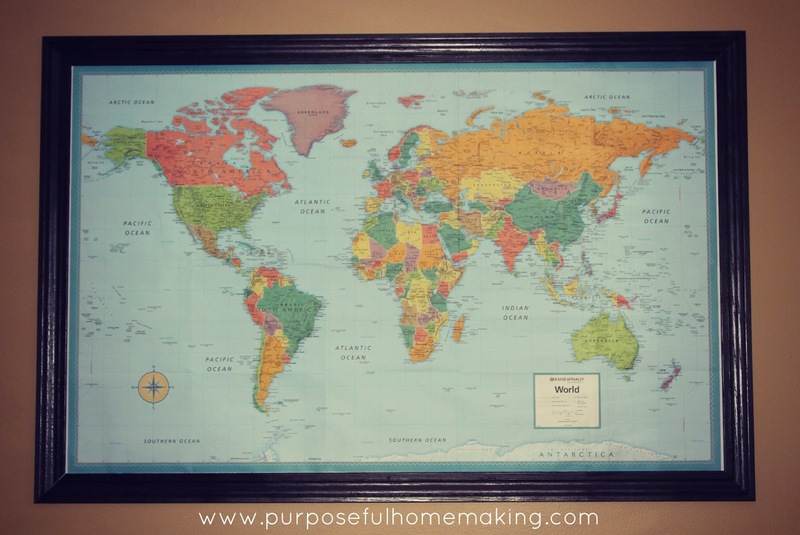 What can give a room a vintage, classroom feel more than a world map? Not much, but one that is framed with some molding gives it a more crisp look making it perfect "art" for our living room setting. 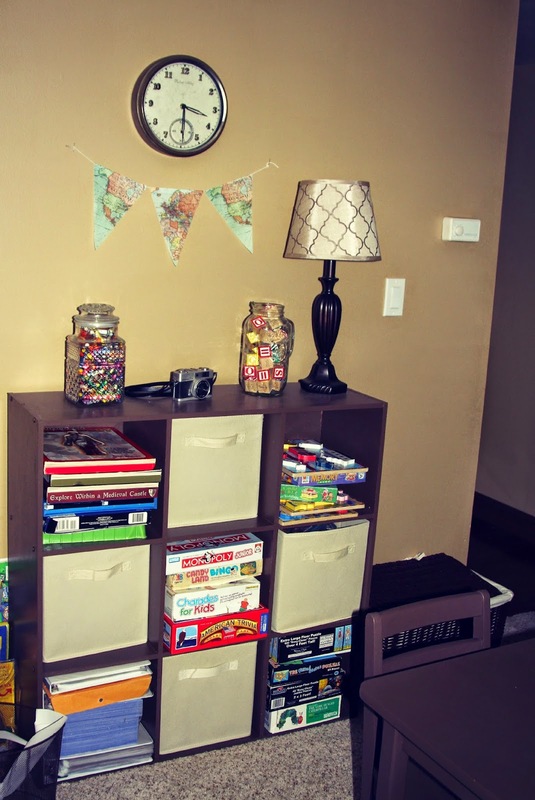 This project was fairly easy (especially considering my husband put up the molding for me!) I bought the molding at Home Depot, spray painted it (my new found redecorating bomb) and hung it around the map. No glass covering. Simply a wall map with molding. Perfect in my book! Even with paring down on so many things, there are still just some things that are nice to have when you have children. So, I purchased this great storage bench to the right of the couch. (pictured below) I use it for dress up clothes and it duals as extra seating since the couch is the only place to sit. Which, BY THE WAY, I LOVE MY NEW COUCH! It is our first piece of brand new furniture in our 10+ years of marriage and I was able to purchase it by selling off what we didn't need on the Facebook group I mentioned. It is smaller than the one we had which gives us a little more space and the colors go much better now, too! I love the basket next to the couch. Guess where I found it? Yep, a garage sale. Guess how I updated it? Yep, spray paint. I love having a space to confine the baby's toys, yet have them easy access on his cute, little, pint-sized level. The basket was exactly what I had envisioned, except it was the wrong color, so I simply spray painted it (along with all of the other baskets in my living room to give them a unified look). 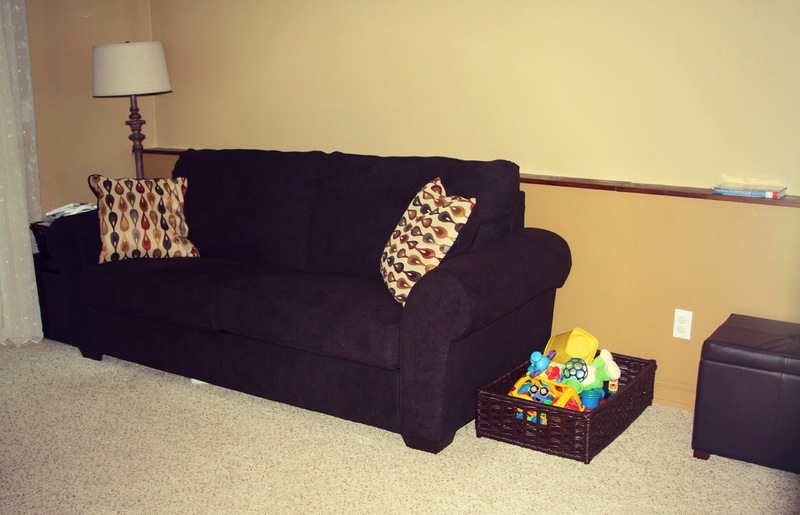 This next corner of the living room was a labor of love. 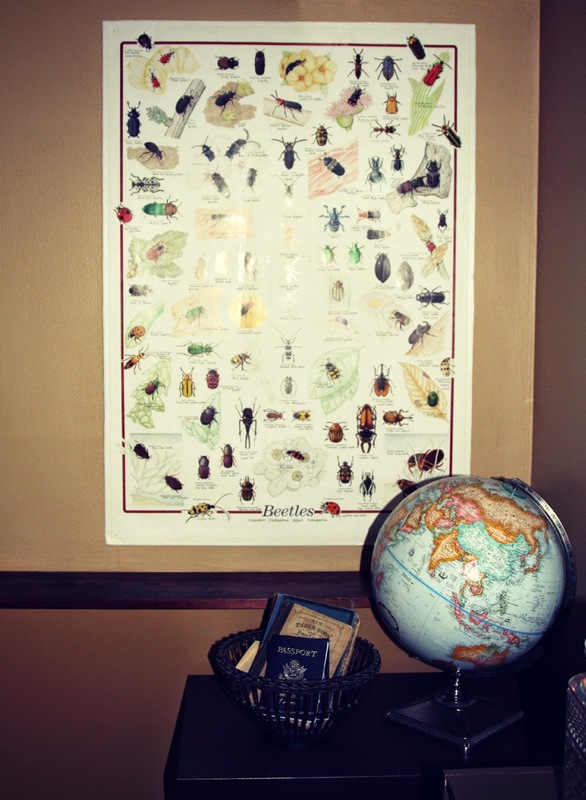 I found the insect poster at a garage sale for pennies and love that it added learning to the room (in the right color scheme amiright?). The globe was from my days gone by as a classroom teacher, the passports are my husband's and mine and go great with our new curriculum, Exploring Countries and Cultures from My Father's World. The old school books were given to me years ago by my husband's aunt and I believe one of them belonged to my husband's grandpa. Everything is resting on a filing cabinet that used to be black and stored in the garage. Now it is spray painted brown (shocker) and holds all my theme files for teaching. And the best garage sale find of all was this table! We used to use individual desks for school, but I decided it would save a lot of space if we switched to a table and chairs. I found this one (which was even better than I had imagined) at a garage sale for only $25. It was transformed into this with DIY chalk paint. I LOVE it. This will give her extra money to get extra. She is homeschooling 5 of her little ones. This would be such a blessing! It would help buy the curriculum we need! We just had a baby and are trying to buy as house! Winning this would be a great opportunity to buy some new curriculum items for our homeschool, as we have been thinking on changing a few things. Thank you for this giveaway! Books, books and more books. And some organizational items, we need another bookshelf. That money would go along way to sprucing up our homeschool area. 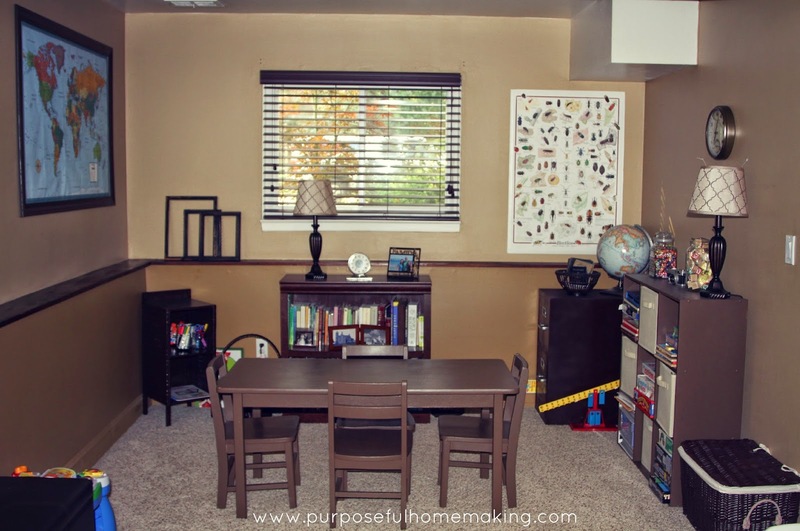 Your homeschool area looks great! My son is only preschool age, so this money would be a huge blessing in just getting prepared to begin homeschooling in kindergarten. Wow, what a great space. Money would help cover the cost of supplies and allow my daughter to do an extra curricular (art class). 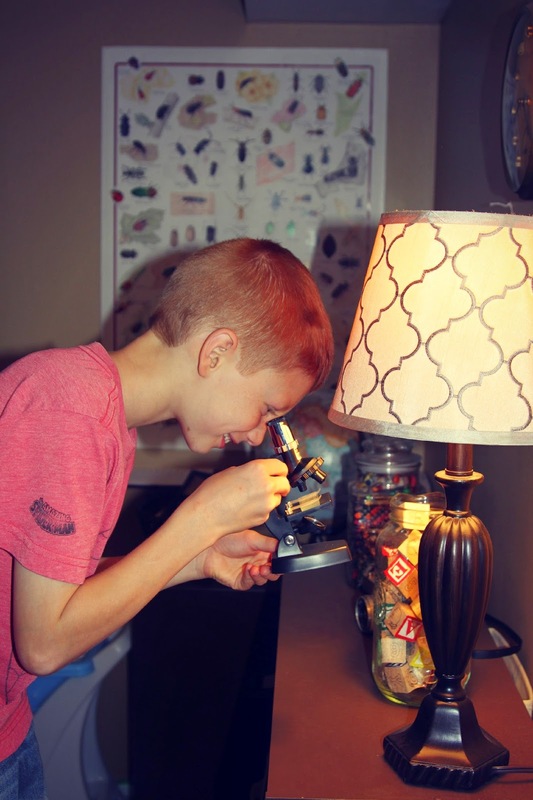 We're just starting out with the homeschool journey so this would really help get us started. This would help us set up our own little homeschool corner in the house. This would help me buy some basic stuff like a globe. We just bought a bunch of cabinets from IKEA for our schoolroom, plus the curriculum for this year. This would help with those expenses! What a great space to learn in! With 5 children, curriculum costs add up quick! 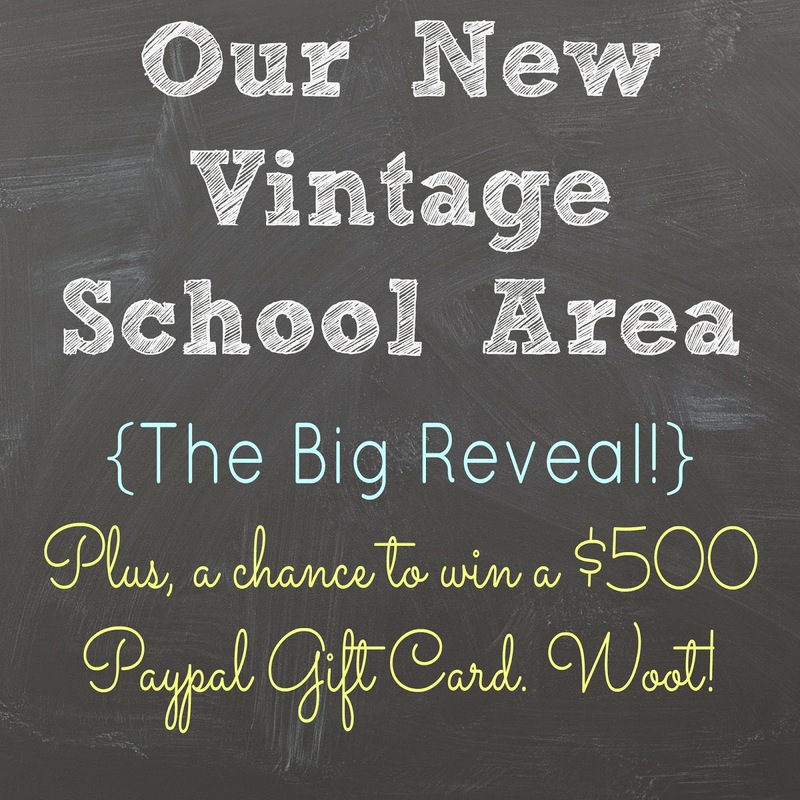 We could use it in many ways :) Thank you for the giveaway, and your new school space looks fantastic! I like abeka, but I would love to try new curriculums. $500 would go a long way in buying my family our needed school books our real food items! It would be a great blessing and answer to prayer. It would allow us to buy the needed materials and curriculum for this years schooling!! I'd love to visit old friends with this,. This would help us to have enough money to make all of the needed repairs on our house. We are in the process of adopting two more girls from Sierra Leone. If I were lucky enough to win, this money would go a long way towards building them new beds. Plus, we would use the money to build a new kitchen table,(one that we could all fit at!) which will be hugely helpful for our homeschooling family!